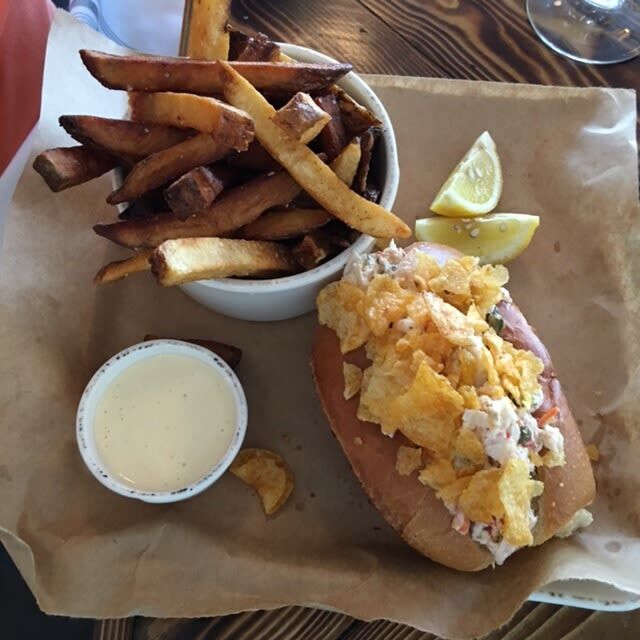 You’d expect the brand-new Veronica Fish & Oyster to have a lobster roll because the kitchen focuses on seafood, and you'd be right. The Veronica lobster roll ($24) differs slightly from the traditional in that this one includes in the ingredients a caper aioli and tiny capers too in the mix. On the top, a crumble of crisp potato chips. The roll is served with lemon wedges and a cup of triple-fried French fries with a lovely mayonnaise-based dipping sauce. Familiar, but a little bit different, too--and delicious. Joey Cucculel’s Mother Truckin’ Good food truck is garnering a well-earned reputation for superbly gourmet sliders (think duck confit with fennel/apple slaw or pork belly with chive mayo), and his wee “classic” beef burgers, which come two to an order, are no exception. First of all, you have to love a guy who asks you how you want your sliders. Order “medium” and you get a juicy round of beef with a hint of pink inside, topped with creamy boursin and a firm tomato slice, all on a pillowy roll. Don’t be surprised if you go back for seconds. The Parmesan beignets ($9) at Indigenous are a classic for a reason: the plump, light-as-air little pastries are completely addictive and served with honey, pears, thyme and a shower of Parmesan cheese. A perfect appetizer, and don't worry--we won't judge if you get two orders.